Home Tint stock a wide range of energy efficient tinting films that selectively filters solar energy, preventing unwanted radiation (both infrared and ultraviolet) from passing through the glass. This type of window tinting can dramatically reduce heat build-up and improve your property’s energy efficiency in the following ways. Cooler temperatures (less running of fans and air conditioning). 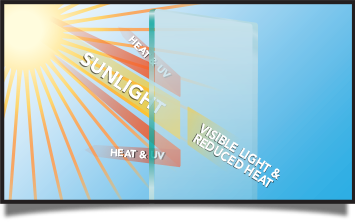 Effective glare reduction & reduced hot spots. A significant reduction in fading of furniture & upholstery. Assists in extending the service life of your air conditioning. Help protect against ultraviolet damage. Keep interior heat inside during the winter.